This is one of the down and dirty, quick and easy recipes. While most of the cooking and baking we do here on the Smith Bites homestead is from scratch, there are times – like now when I have several deadlines looming over the next two weeks – we still want to eat well yet have something ready in less than 30 mintues. And this soup is one of those recipes. 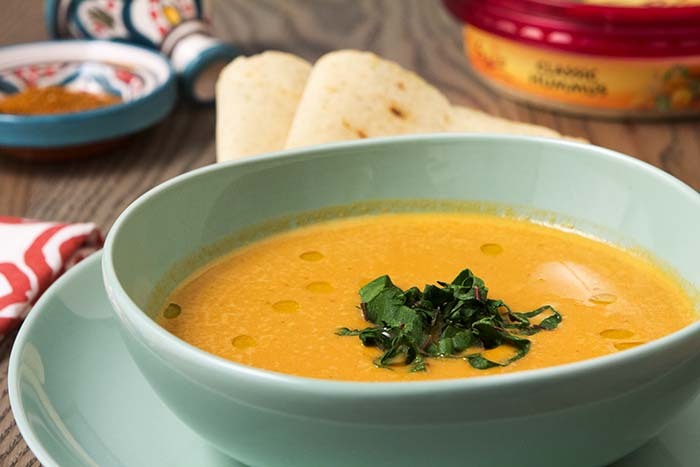 We always have a container (or two) of Sabra hummus on hand and while most people think of dipping fresh veggies in hummus (and that’s a perfectly acceptable way to enjoy hummus) not many people think about using hummus as a base for soup or other warm dish. Sometimes I have canned or dried chickpeas on hand, but when I don’t, I grab the container of hummus from the refrigerator and start adding chicken or vegetable broths (coconut milk works fantastic too), maybe some chopped tomatoes, onion, garlic and a few greens. At this point, it’s really a matter of deciding which flavor profile you’re looking for – Curry, Mexican or in this case, Moroccan. Common spices used in making these types of stews or ‘tangines’ are: salt, pepper, ginger and tumeric; adding a few additional spices will give you the depth of flavor you’re looking for without having to let a dish simmer all day long. 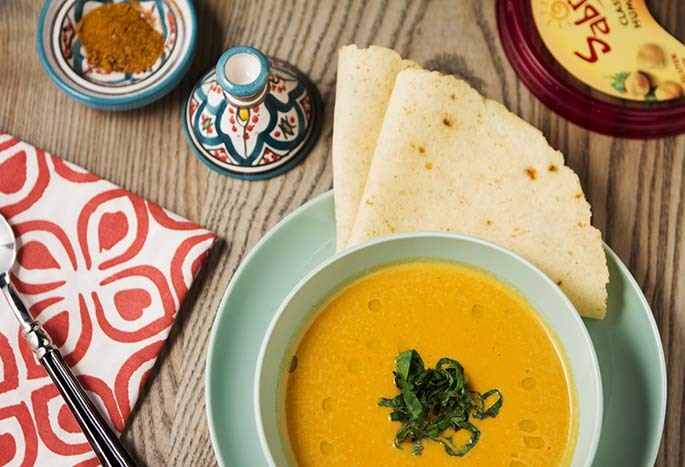 In this recipe I used a blend of spices known as ‘Ras El Hanout’ but cinnamon, cumin, paprika, saffron or cardamom are warm spices that blend well with chickpeas, aka, hummus. 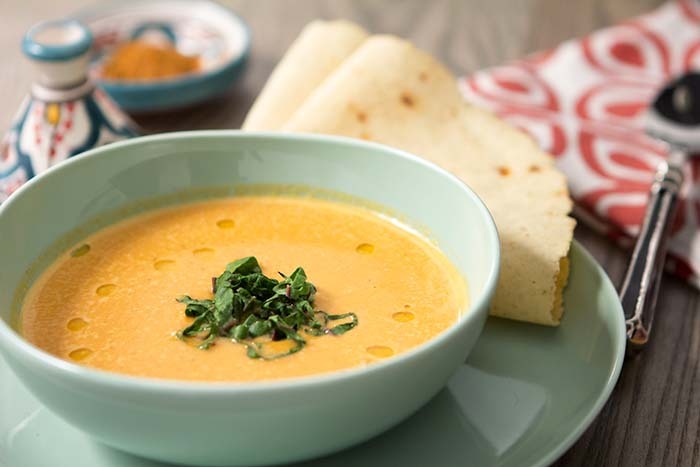 A little sautee of vegetables, add a little liquid, ready-made hummus and give it all a whirl in a blender; heat and ladle into bowls – serve with warm pitas or wraps and lunch or dinner is served! May 15th is National Hummus Day and Sabra has some really fun ways in which you can participate and win some great prizes too! ON FACEBOOK: For National Hummus day and Sabra is celebrating in a big way and you can be a part of that celebration! Click on Sabra’s Facebook page on May 15th to grab coupons for National Hummus Day and download their ebook ‘Hummus for Dummies’ starting that day – it’s a fun way to test your knowledge about all things hummus! Disclosure: The Professor and I have been Sabra Tastemakers for 3 years now and this is a sponsored post; however, all opinions are mine. Starting with ready-made hummus cuts the cooking time in half which is great when everyone is starving and you want to get something ready quickly. And if you don’t have Ras El Hanout in your spice drawer, you can substitute warm spices like cinnamon, cumin and cayenne pepper or paprika and saffron.